The village I live in at the moment is connected to the big city by buses. There is no other public transport. Having lived in South London, my amygdala gets stressed out at an idea of taking a bus. But I must say bus ride here is a very different experience. One thing puzzled me for a while though. Why on a bus route chart some stops are shown as black dots and some as white dots? I read the small print and saw NIET (not) in block letters next to black dots so decided that it meant bus does not stop there. It did not make sense and was a source of constant dread. As somebody very smart once said, assumptions are a mother of all f… ups. When I finally google translated the whole phrase – niet rolstoeltoegankelijke halte – the mystery was revealed. Stops marked as black dots are not wheelchair accessible. 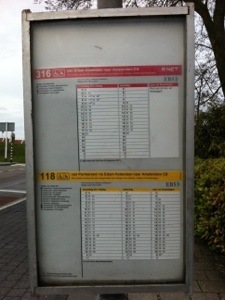 Image | This entry was posted in default and tagged bus, dutch, happiness, mystery, netherlands, nomad. Bookmark the permalink.